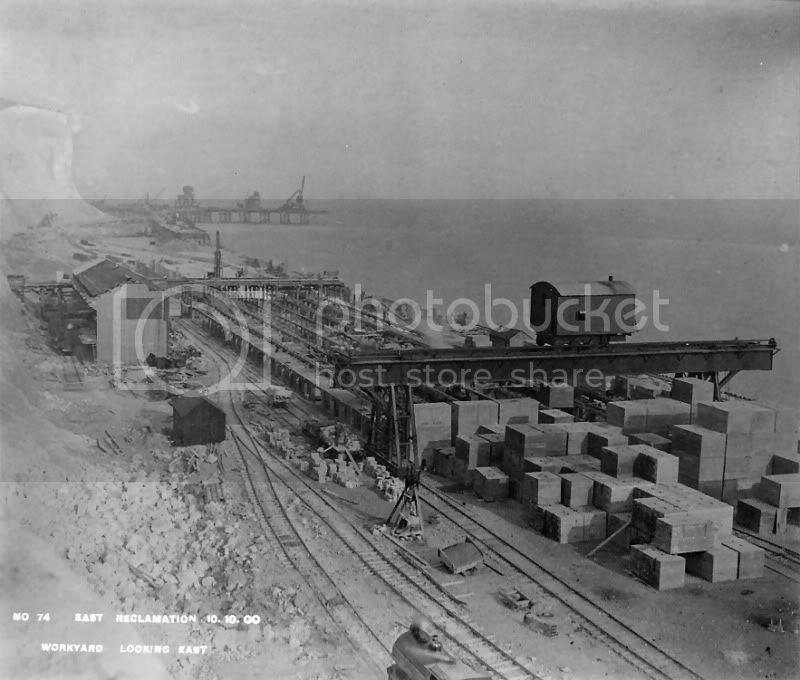 There are a number of pictures from the reclamation works in 1899, prior to the eastern block yard being built, that show wagons with blocks on, as per the pic below. The Sea wall had to be constructed from blockwork, so where did they come from? This picture show the wall under construction at that time. Without source to prove otherwise, it would seem likely that the blocks were manufactured elsewhere, then bought to site, possibly by rail, more likely by sea. I can't categorically state that no blocks were ever constructed at Sandwich and back it up with a source, but I do think it very unlikely. If such blocks had arrived at the clifftop terminus before the funicular was built they would have to have come down the cliff face: would they have survived it undamaged? I think not. Could the funicular have taken concrete blocks of the size that were used? Again, I think not. Thanks for the input - though I did not state that all the blocks were built at Sandwich - my source of reference (from the 1930s) on this states quite clearly that whilst the land at the base of the cliffs was being reclaimed, the blocks were being cast at Sandwich, production moving to Dover once the reclaimed land had been secured. Can you catagorically state from source that this wasn't the case? I'd wouldn't want to be inaccurate, equally I don't want to ignore the possibility. Sorry to have to take issue with you, Islesy, but the concrete bocks were made at Dover, not Sandwich. It was shingle that was brought from Sandwich (thus forming Stonar Lake) and then at first pitched down the cliff face, later brought down on the funicular, and later still (after Pearson’s ‘New Road’ was cut) brought right down to ground level on trains. 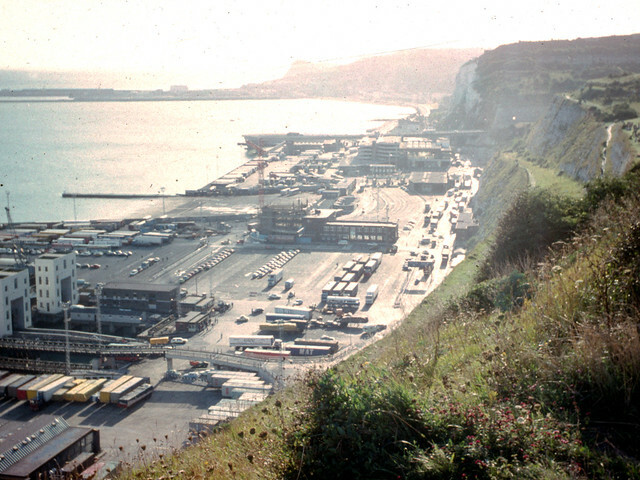 The construction of Dover’s harbour was originally conceived as the National Harbour Project, and by the time of its completion it was the largest artificial harbour ever constructed. It was, without doubt, a tremendous piece of engineering skill. Eleven years, and £4,000,000.00 (£228,240,000.00 in today’s currency) was spent constructing a harbour covering 610 acres at low tide, and the contract for the undertaking was awarded to S. Pearson & Sons, the engineers for the Admiralty being Coode, Son & Matthews. Work on the project began in March 1898, and the first task was to reclaim part of the foreshore to the east of the Atholl Terrace area. This undertaking involved hundreds of labourers, all roped together, drilling and blasting the cliff to form a solid platform. Against this a 1300 yard sea wall was built using 3 ton concrete blocks, creating an area of reclaimed land of around 21 acres which was to be used as a site for concrete block making, workshops, foundries etc. Whilst this reclamation work was being undertaken, work began on the Admiralty Pier and East Arm. At this point the huge concrete blocks used in the construction of the harbour walls were made at Sandwich, and transported to Dover first by sea, then by Pearson's own railway across from the main line at Martin Mill. 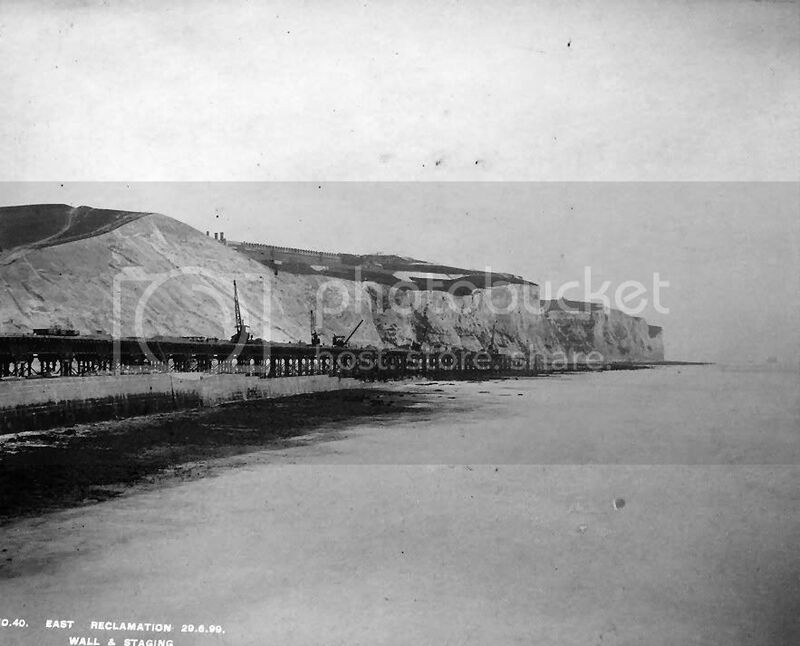 A funicular railway was built to transport the blocks down the cliffs to the yard below, whilst ballast was bought in from the vast gravel pits at Stonar and Rye. The construction of the harbour walls at Dover differed critically from most other harbours in that the wall rose directly from the sea bed, and not from a rubble foundation mound, increasing the strength of the walls. The blocks used in the construction ranged from 25 to 42 tons each, and around 64,000 were used in the sea walls. Including the blocks used in the foreshore wall and all the apron blocks used on the seaward side of the breakwaters, a grand total of around 3,000,000 tons were used, most of which is below sea level. Although another block making yard was established at the western end of the port, by the Town Station, making blocks for the Admiralty Pier extension but the eastern yard was far larger, and the majority of blocks were made here.The block making process took the best part of 8 weeks from start to end, and was incredibly well planned. Rail trucks tipped the sand, shingle and cement mix into hoppers, which in turn delivered the aggregate mix into the mixers. After 15/16 revolutions, the mix was poured into greased wooden moulds, open at the top with removable sides, rammed in and the surface 'struck off' with a straight edge. Having been filled, the blocks were left to set for two days before the moulds were slackened off, and after a further six days they would be set enough to be removed by huge 45 ton 'Goliath' cranes that run up and down the yard. The blocks were then stacked at one end of the yard and left to cure for a further six weeks. For ease of handling the blocks were 'cored', allowing an oblong bolt with a 'T' head to be slotted in, which in turn attached to the crane's hook. Semi-circular indentations in each block's side were matched up when a block was slid into its final position, then filled with concrete to bind the blocks together. Finally, the blocks were faced with granite from a Cornish quarry to render them weatherproof. Having done the 'easy' part in constructing the blocks, they then had to be placed into position. A temporary wooden staging pier was solidly constructed from Australian Blue Gum, a wood that is incredibly dense, resistant to sea worms and crustaceans, and able to bear the weight of the 100 ton Goliath cranes. Lattice girders bridged the central gap, and a wooden platform, 28 feet above the high water mark, supported the rails along which the cranes and rail trucks ran. In building the staging, over 1,500,000 cubic feet of timber were used, most of which was shipped over from Tasmania. To secure the foundations into the sea bed, giant clamshell grabs were used, capable of lifting 5 tons of flint and chalk and filling a rail truck in one go. In those areas where the grabs were unable to find purchase, a solid block of iron with three teeth, a “breaker', were used to pound their way into the sea bed. Once the chalk crust had been broken away and solid bed reached, divers were sent down in diving bells to manually level the bed rock. Weighing in at 40 tons, four men worked in the bell which was seven feet high. As it was lowered, water was expelled using compressed air, and a final burst would expel the remaining two feet of water once the bell was on the sea bed. Working in shifts of 3 hours, the divers would dig the ground until it was perfectly smooth and level, the waste material being thrown into a large wooden box in the centre of the bell. Dress divers were responsible for the setting of the blocks underwater, working from small boats. They communicated with the crane drivers lowering the blocks using signals, guiding them into exact position before disengaging the bolts. Between 1500 and 1800 workmen were engaged in the harbour’s eleven year construction, which was finally opened by King George V (who was then Prince of Wales) on October 15, 1909. There are three distinct types of breakwaters: - (r) A simple rubble or concrete-block mound; (2) a mound for the bottom portion, surmounted on the top by a solid superstructure of masonry or concrete; and (3) an upright-wall breakwater, built up solid from the sea-bottom to the top. The second type forms a sort of combination of the first and third types; and each type presents several varieties. In a few harbours, two different types have been adopted for different situations at the same place; but generally the choice of type is determined by the materials available at the site for the construction of the breakwater, the nature of the sea-bottom and the depth into which the breakwater has to be carried. Upright-Wall Breakwaters. - The third type of breakwater consists of a solid structure founded directly on the sea-bottom, in the form of an upright wall, with only a moderate batter on each face. This form of breakwater is strictly limited to sites where the bed of the sea consists of rock, chalk, boulders, or other hard bottom not subject to erosion by scour, and where the depth does not exceed about 40 to 50 ft. If a solid breakwater were erected on a soft yielding bottom, it would be exposed to dislocation from irregular settlement; and such a structure, by obstructing or diverting the existing currents, tends to create a scour along its base; whilst the waves in recoiling from its sea face are very liable to produce erosion of the sea-bottom along its outer toe. Moreover, when the foundations for an upright-wall breakwater have to be levelled by divers, and the blocks laid under water by their help, the extension of such a breakwater into a considerable depth is undesirable on account of the increased pressure imposed upon diving operations. Footnote: Does anyone know how Ramsgate Royal Harbour's Upright wall Breakwaters (started construction 1749 and completed 1850) were built? I can find nothing by Googling! That's a great find Mosky. I don't know why I didn't answer your question: there are, or were photos on the forum of some of the diving-bell gangs. In the 1901 census of Dover, there are quite a few 'bell-divers' and 'diver's-labourers' living about the town. An ancestor of my wife was a diver's labourer, and he lived our road. there was also a bell-diver, a diver, the same road. Extract from 1911Encyclopedia which seems to give the detail of construction. I think this was a wonderful achievement 100 years ago. The Admiralty pier at Dover was begun about the middle of the 19th century, and furnishes an early and notable example of an upright-wall breakwater resting upon a hard chalk bottom; and it was subsequently extended to a depth of about 42 ft. at low tide, in connexion with the works for forming a closed naval harbour at Dover. 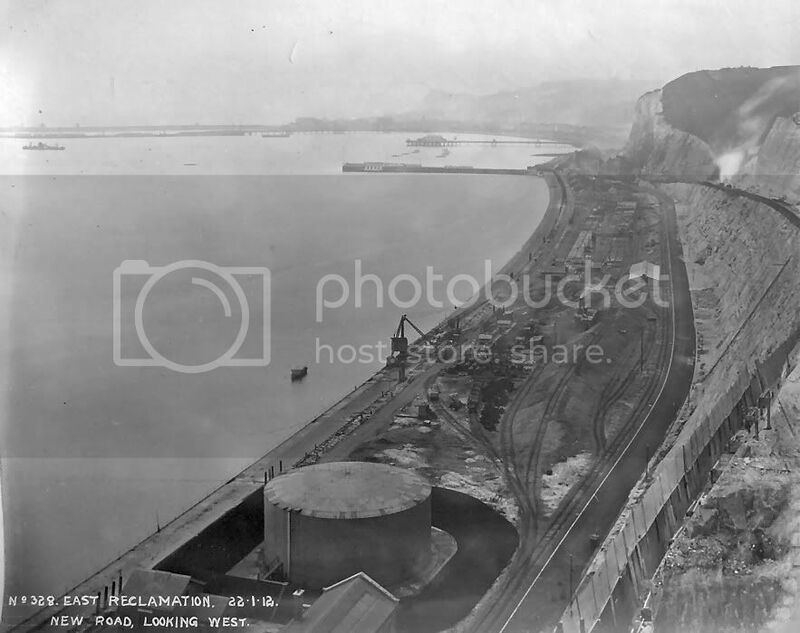 This breakwater, the Prince of Wales pier of the commercial harbour, and the eastern breakwater and detached south breakwater for the naval harbour, were all founded on a levelled bottom, carried down to the hard chalk underlying the surface layer, by means of men in diving-bells. The extension of the Admiralty pier and the other breakwaters of Dover harbour consist of bonded courses of concrete blocks, from 26 to 40 tons in weight, as shown in figs. 13 and 14, the outer blocks above low water being formed on their exposed side with a facing of granite rubble. The blocks, composed of six parts of sand and stones to one part of Portland cement, moulded in frames, and left to set thoroughly in the block-yard before being used, are all joggled together, and above low-water level are bedded in cement and the joints filled with cement grout. 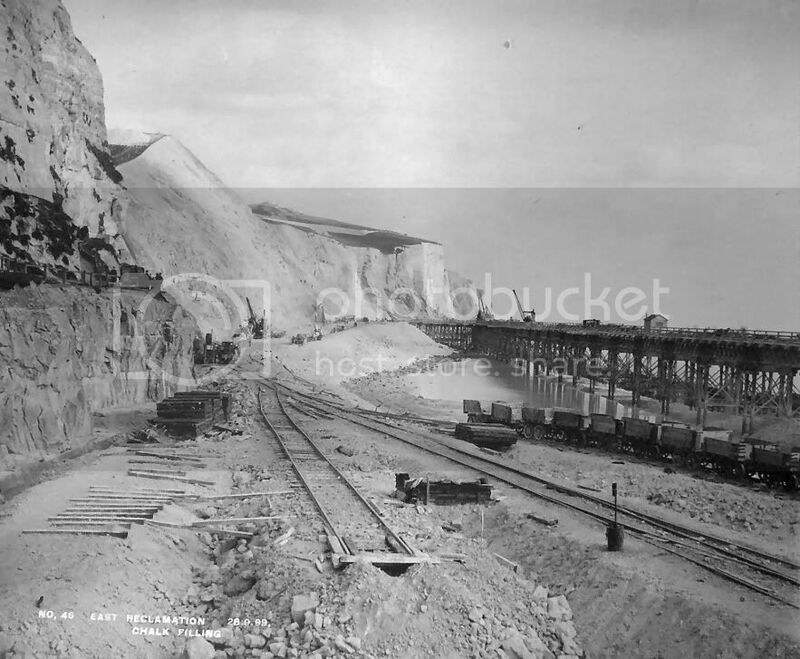 The blocks were laid by Goliath travelling cranes running on temporary staging supported at intervals of 504 ft. by clusters of iron piles carried down into the chalk bottom. On each line of staging there were four Goliaths, preceded by a stage-erecting machine. The front Goliath was used for working a grab for excavating the surface layer of chalk, which was finally levelled by divers, the second for carrying the diving-bell, the third for laying the blocks below low water, and the fourth for setting the blocks above low water. This succession of Goliaths enabled more rapid progress to be made than with a single Titan at the end of a breakwater; but it involved a considerable increase in the cost of the plant, owing to the temporary staging required. The foundations were carried down from 4 to 6 ft. into the chalk bottom, the deepest being 53 ft. below low water of spring tides, and the average 47 ft. With a rise of tide at springs of 184 ft., the average depth is thus approximately 66 ft. at high tide, necessitating a pressure of 29 lb on the square inch, which is the limit at which men can work without inconvenience in the diving-bells. The breakwaters are raised about 11 ft. above high water of springs. The detached southern breakwater Dover Breakwater. I'd guess that Ramsgate was the third, but as always, I could be wrong. Could be a good call, but Ramsgate Royal Harbour started construction 1749 and completed 1850. Unless in 1839 the third refuge meant to update Ramsgate? Then on to 1977, Jubilee Way has just been opened and No.1 Freight Building is under construction. 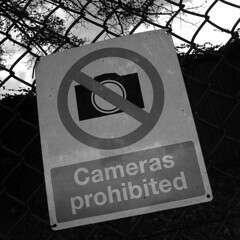 When i said negatives, i should have said glass plates, still got them, some are broken but still have all the pieces. 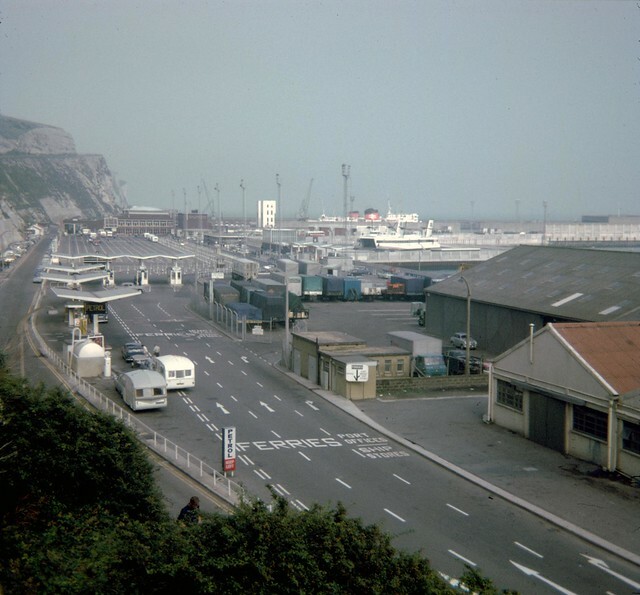 Re the caves mentioned on page 1, some of these were inhabited: see Peter & Julie Burville's The White Cliffs of Dover (pub. Triangle Publications, Dover, 2001, 2003. ISBN 0 9539478 1 5). Some good early pics in this, too.